This cover has made it to most Nigerian blogs and it's easy to see why. The ladies on it are beautiful, hardworking and well known in the entertainment circles. However, this blog is not to call them hot chicks or exalt that "Nigerian Girls are getting bolder". While I'm usually not one to call out fellow women on the choices they make in their life and work, I just had to say this. Permit me. I don't know the other two very well, but Toke I had sorta been following, she has a blog, also vlogs, and was campaigning against cancer the other day. I equally saw an interview she had with Ebuka Obi Uchendu not too long ago. In it, she referenced a small, or if you will, big, fall out with Linda Ikeji on who is and who isn't supposed to be a role model. And then I see her pimping herself in underwear on a male magazine cover? I know these are all up-and-coming talent, and they're hustling to make the most of their fame and maximize their popularity, but by a lot of standards, they are successful, they are celebrated, people look up to them. I wonder if they realize this, and if they really consider the message they're sending out to the younger women who are following behind? They're basically saying that it doesn't matter how successful, talented or smart you are, what is important to get ahead is to show men that you are sexually available to them, are at least, you're willing to make yourself look that way in public. The fact is that these women are not lingerie models, neither are they musicians at a concert, so we can't say they're just doing their job. What exactly are they doing? 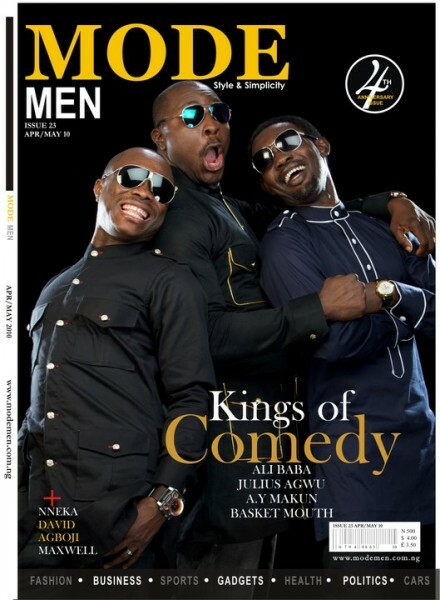 Compare their cover to the Kings of Comedy cover of Mode Men, which in 2010 featured three male entertainers. The difference is clear, isn't it? I know we copy a lot of things from abroad, after all, loads of female stars have appeared almost or totally naked on GQ and Esquire covers, but let's also be critical about what we see and emulate. Maybe Toke was conflicted about the shoot, or maybe she simply wanted to be a bit modest, and that's why she hid her lady bits by sitting in the middle. Or maybe the photographer wanted it that way. Whatever the case, ladies, think twice next time before you begin to take your clothes off for a male magazine's camera.